Email: Seaford Osteopathic Clinic here. We offer a FREE 15 minute Consultation. 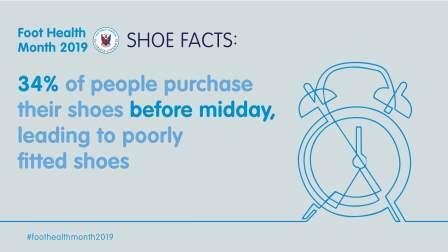 You are here: Seaford Osteopathic Clinic > Latest News > General News > April Foot Health continued..
Did you know that shoe shopping in the morning could be bad for your feet? ← April is Foot Health Month! However, early or later appointments are available. Please call us for details on: 01323 892002. A charge of £15 is made when patients fail to attend for an appointment. Seaford Osteopathic Clinic, Paignton House (Opposite Seaford Library), Warwick Road, Seaford. BN25 1RS. I have been coming here for many years. I find all the staff very kind and helpful, especially Liz who treats me. April is Foot Health Month! Copyright © 2019 Seaford Osteopathic Clinic. N.B. Some images are Copyright The General Osteopathic Council.